Wire racks allow you to use space more efficiently in the garage, closet, or just to get better organized throughout your home. Wire racks are a convenient and cost effective storage solution that are durable and easy to assemble. 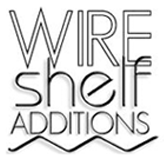 Our wire shelving systems can help you arrange your items neatly so you never have to go on a hunt for something you need quickly. We carry everything from smaller, multi-purpose wire storage racks to heavy duty, industrial wire storage racks. Before selecting any type of wire rack, you should know the sizes and weight of the items you are planning to store, as well as the size of the space needed to fit the wire rack. Once you have determined what you need out of a wire rack and how much floor and vertical space you have, check out our selection of quality wire racks. We carry wire storage racks that can help you bring some much needed organization to your home. Whether you need a large multi tier wire rack to organize tools in the garage or wire shoe rack to straighten out your closet, Wire Shelf Additions has you covered.